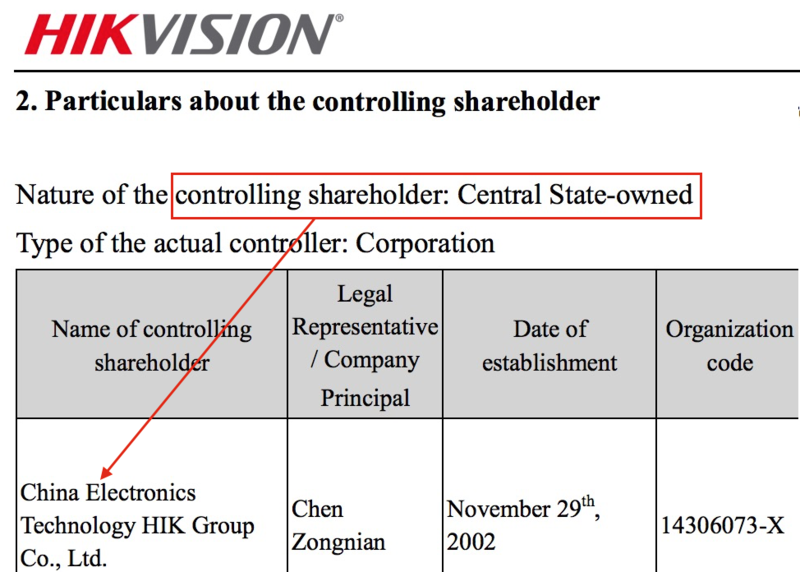 The Chinese government created Hikvision and is Hikvision's controlling shareholder. Hikvision's Chairman, a Communist Party Secretary, has pledged allegiance to the China Communist Party. 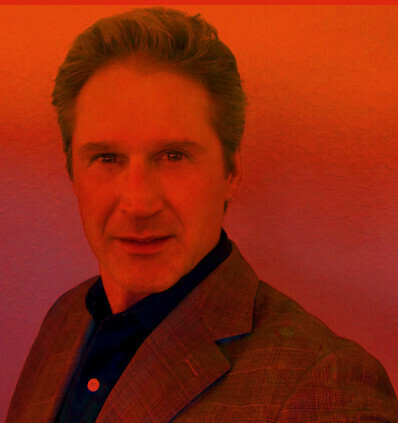 Hikvision's VP of R&D simultaneously works for the Chinese government. China has a history of cyber attacks against the USA. China exerts authoritarian control of their country and people. While Davis is an expert in cybersecurity, rather than politics and economics, he surely is smart enough to read through those primary documents to understand the truth about Hikvision's ownership and control. Of course, he is in a difficult position. For him to continue being paid, he has to follow the party line (pun intended). And cybersecurity is not simply about technical flaws, it is about countries adversarial to one's own exploiting systems (e.g., of companies they control) for geopolitical advantage. Just this week, The FBI, CIA and NSA say American citizens shouldn't use Huawei phones. And Huawei's Chinese government 'connections' are far less clear and definitive than Hikvision's. Davis will continue his public relations tour and he should speak about and be questioned on Hikvision's Chinese government control. We encourage Davis to face these facts. 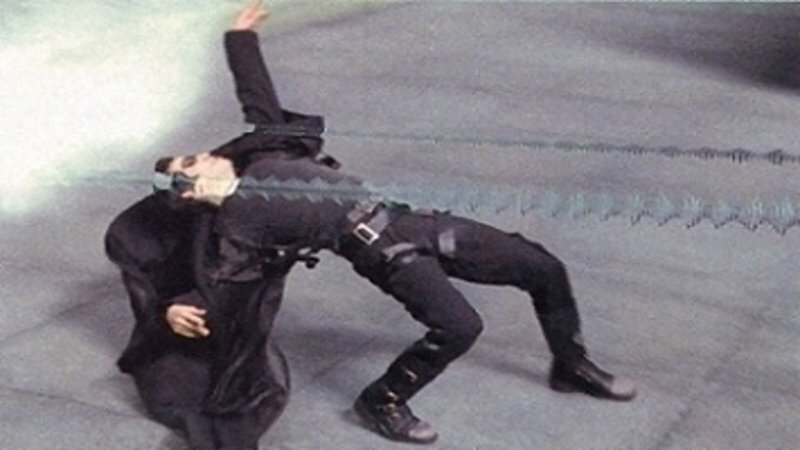 Actual snapshot of Hickvision making their PR plans to address their network security. subheader: Never bite the hand that feeds you. "I’m here to support the sales team, said Davis, but my goal here is to create good, secure products and make people aware." Agreed, he is in a marketing role. But what about NVR’s? Are they Ok? Are they really any different from a network perspective? Hopefully he / they update their hardening guide which continues to recommend port forwarding to directly put devices on the Internet. Also, it's funny, when our guys call Hikvision tech support to see what they will say about HikConnect speed / connectivity issues, each time they recommend port forwarding. "each time they recommend port forwarding"
Where do I read your recommendation? Each time Hikvision's tech support recommends port forwarding. It's their recommendation, not ours. I don't recommend using port forwarding.  Don’t use hik-connect. I’m a Hik fan but I use vpn to access nvr or hikcentral. Cctv devices are blocked by FW, no cloud services enabled. However, in practice, UPnP is unreliable in many cases. In many business networks, large and small, UPnP functions are turned off, requiring manual port forwarding. In consumer use, port mappings may not function properly, may be added more than once, may conflict with other devices, or may simply not be added at all. Making things worse, error information is rarely available when UPnP port mapping fails, leaving the user without any means of troubleshooting. Because of these reasons, manual port forwarding has proven more reliable in commercial surveillance, with UPnP typically left to consumer use. So are you saying you think UPnP is more reliable than setting ports manually? #3, thank you. I am going show you how much more responsible IPVM is than your partner Hikvision. Using UPnP, DDNS and/or port forwarding exposes one's devices to the entire public Internet, meaning that anyone can attempt to connect and access one's device exposed (e.g., camera or recorder). 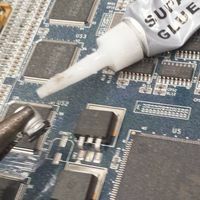 Hackers can attack hundreds of millions of devices a day across the public Internet, either simply by randomly trying IP addresses or by finding lists of potentially vulnerable devices (e.g., Shodan list of Hikvision public accessible - typically port forwarded devices). For those unfamiliar with this risk, see The Atlantic's The Inevitability of Being Hacked: We built a fake web toaster, and it was compromised in an hour. More directly related to video surveillance, the massive Dahua hacking and the Hikvision IP camera hacking was driven by those devices being either port forwarded or UPnP enabled. We do not recommend making your devices publicly accessible. We recommend VPNs to properly secure your video surveillance devices. While port forwarding (or UPnP, DDNs, etc.) may be cheaper and simpler up front, they expose your devices to being attacked and hacked as new vulnerabilities are found. While cloud services are being improved, you run the risk of them being exploited and/or the cloud service provider accessing or abusing your system. I am happy to update further if that helps. This will also be pushed out into an updated version of the 2018 book later today. Now, let's compare IPVM's response to Hikvision's. 5 months ago, they hired Chuck Davis. And, yet still, no change. 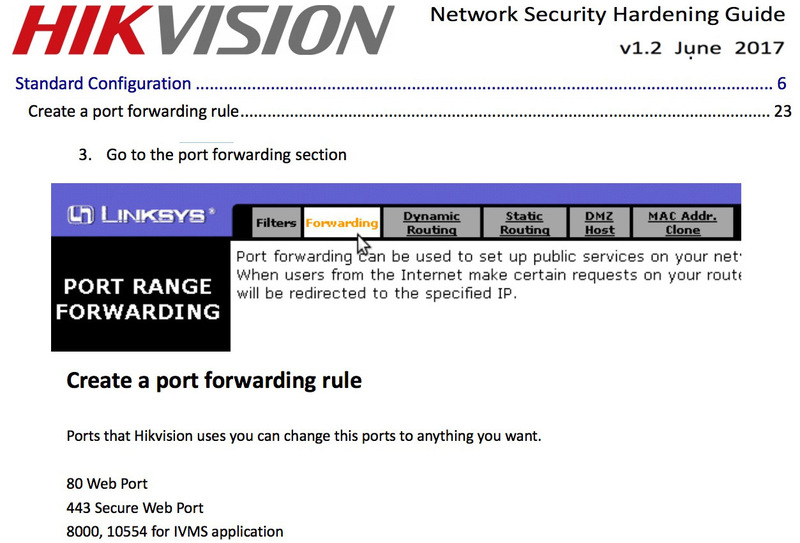 It is still in their hardening guide and Hikvision continues to recommend port forwarding. #3, do you think Hikvision is being responsible continuing to recommend port forwarding? And the 2018 IP Networking Book is now updated with the above-referenced changes. "#3, do you think Hikvision is being responsible continuing to recommend port forwarding?" If government security agencies are advising citizens against using Huawei phones due to security concerns, should they also be looking into the fact that HiSilicon, the chip vendor that makes almost all of the processors in the current IP camera and NVR/DVR market from China, is also owned by Huawei? Story on HikVision yesterday on Full Measure. Interesting article. I think that it gets lost or shuffled away as conspiracy theory when people think that these devices will be used to actively monitor what they are looking at. After all, why does the local Mom-n-Pop convenient store guy think that the Chinese government is going to spy on him? I find it much more troubling that these devices are not necessarily being used as active devices for spying, but that they are so dramatically insecure and are going to be more and more used as agents in botnet networks. I know which PSA TEC session I will be attending. 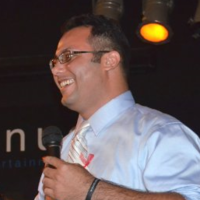 Can we start a fund to pay Bashis' way to go to this so that he may offer a few pointers? Thanks, but no thanks. I'll may do it anyhow, if I get the interest. I feel this is a case of allowing your pay to determine your ethics.